This set of Data Structures & Algorithms Multiple Choice Questions & Answers (MCQs) focuses on “KD Tree”. 1. In what time can a 2-d tree be constructed? Explanation: A perfectly balanced 2-d tree can be constructed in O(N log N) time. This value is computed mathematically. 2. 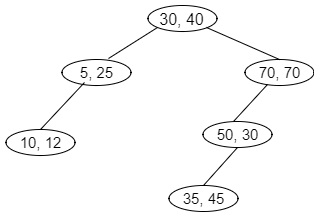 Insertion into a 2-d tree is a trivial extension of insertion into a binary search tree. Explanation: Insertion of elements in a 2-d tree is similar to that of a binary search tree. Hence, it is a trivial extension of the binary search tree. 3. In a two-dimensional search tree, the root is arbitrarily chosen to be? Explanation: In a two- dimensional k-d tree (i.e.) 2-d tree, the root is arbitrarily chosen to be an odd level and it applies to all 2-d trees. 4. 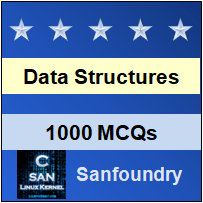 Which of the following is the simplest data structure that supports range searching? Explanation: K-d trees are the simplest data structure that supports range searching and also it achieves the respectable running time. 5. In a k-d tree, k originally meant? Explanation: Initially, 2-d trees were created. Then, 3-d trees, 4-trees etc., where k meant the number of dimensions. 6. What will be the correct sequence of insertion for the following k-d tree? Explanation: The correct sequence of insertion of the above given tree is (30,40),(5,25),(10,12),(70,70),(50,30),(35,45). The insertion is given by, first left, then right. 7. Each level in a k-d tree is made of? Explanation: Each level in a k-d tree is made of dimensions and cutting. Cutting and dimensions are used for insertion, deletion and searching purposes. 8. What is the worst case of finding the nearest neighbour? Explanation: The worst case analysis of finding the nearest neighbour in a k-d tree is mathematically found to be O(N). 9. What is the run time of finding the nearest neighbour in a k-d tree? Explanation: The run time of finding the nearest neighbour in a kd tree is given as O(2d log N) where 2d is the time taken to search the neighbourhood. 10. How many prime concepts are available in nearest neighbour search in a kd tree? Explanation: Three important concepts are available in finding the nearest neighbour. They are partial results, pruning, traversal order. 11. Reducing search space by eliminating irrelevant trees is known as? Explanation: Pruning is eliminating irrelevant trees. Partial results are keeping best results and updating. Traversal is visiting all the nodes of a tree. 12. Several kinds of queries are possible on a k-d called as? Explanation: Several range queries are possible on a k-d tree. One of the range queries is known as a partial match query. 13. What is the time taken for a range query for a perfectly balanced tree? Explanation: For a perfectly balanced k-d tree, the range query could take O(√N+M) in the worst case to report M matches. 14. The 2d search tree has the simple property that branching on odd levels is done with respect to the first key. Explanation: Branching on odd levels is done with respect to the first key and branching on even levels is done with respect to the second key in a 2-d tree. 15. Who invented k-d trees? Explanation: Jon Bentley found k-d trees. Rudolf Bayer found red black trees. Arne Andersson found AA- trees.